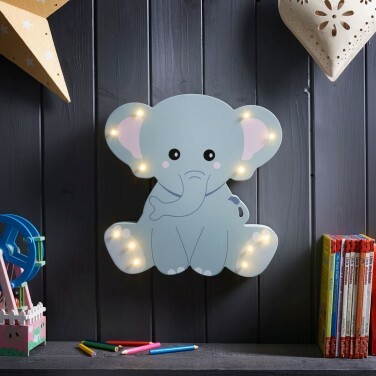 The cutest of decorations for kids rooms, Ellie the elephant is lit with delicate fairy lights for a magical glow. The sweetest of lights for kids rooms, this adorable wooden elephant decoration is lit with warm white LEDs for a soft glow. 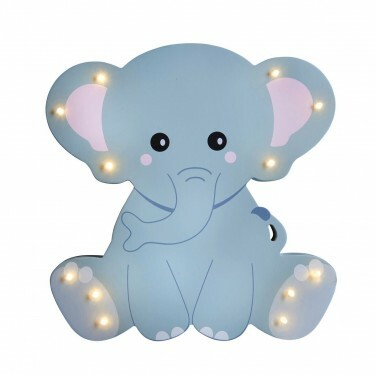 Made from MDF, this cute elephant can be wall mounted or free standing, and battery operated, Ellie the elephant can be placed anywhere adding magical fairy lighting and a soft cosy glow. Lit by warm white LEDs, this colourful rocket wall decoration gives your child's room a magical glow! Sitting tall, this adorable giraffe lamp adds character to your child's room and a cosy glow. Give your child's room a warm comforting glow from this adorable baby elephant ceramic lamp. Add character to children's spaces indoors or outdoors with this adorable zebra pull cord lamp!